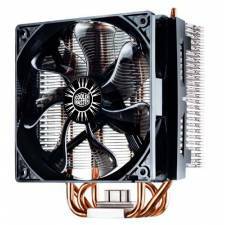 RR-T4-18PK-R1 - The CoolerMaster Hyper T4 is an affordable mainstream Heatsink delivering great cooling performance on all modern platforms thanks to its 4 specially shaped direct touch Heatpipes. The T4's 120mm PWM fan features a wide fan speed range and can be fine tuned for maximum airflow and cooling performance or silent operation. Thanks to this flexibility, a quick and easy snap-on fan bracket and a universal mounting system the Hyper T4 is a great match for any system. - 4 Direct Contact heatpipes for seamless contact between cooler and CPU. - 120mm wide range PWM fan, RPM can be fine tuned for maximum airflow or whisper quiet operation. - Snap-On fan brackets to quickly and easily install, remove, clean or replace the fan or heatsink. - Versatile all-in-one mounting solution supporting the Intel LGA 2011/1366/1156/1155/775 and AMD FM1/AM3+/AM3 /AM2.